Head coach Chris Klieman will coach one final game at NDSU. The most dominant college football team in the country is back in the national championship game for the seventh time since 2011. North Dakota State University stomped rival South Dakota State University 44-21 in Friday night&apos;s national semifinal matchup, piling up 439 rushing yards and scoring 30 points in the second half. NDSU, ranked No. 1 in the country, is one win shy of earning its seventh national title since 2011, including three under current head coach Chris Klieman (2014, 2015, 2017), who coached his final game at Fargodome and will become the head coach at Kansas State after the national title game. Klieman took over the head coaching job at NDSU after Craig Bohl won three titles (2011, 2012, 2013) and then left for the head coaching job at the University of Wyoming, where he coached current Buffalo Bills rookie quarterback Josh Allen. Related: NDSU&apos;s Klieman named head coach at Kansas State. As for this year&apos;s Bison, quarterback Easton Stick led the Friday night attack with 147 rushing yards and three touchdowns along with a near perfect night passing the ball, going 12-of-15 for 169 yards and another score. The other national semifinal is Saturday at 1 p.m. between No. 3 Eastern Washington and No. 7 Maine. NDSU will face the winner in the Jan. 5 national title game in Frisco, Texas. NDSU won its seventh FCS championship on Saturday. NDSU will play Butler at Target Field in 2019. He's been a part of all six championships since 2011 at NDSU. 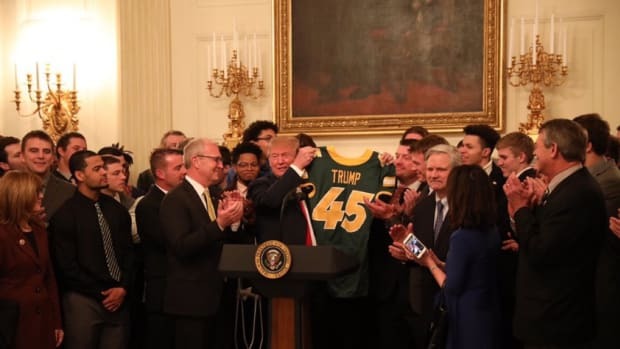 President Trump had the NDSU football team laughing on Monday. NDSU is again a No. 1 seed in the college football playoffs and they could be in line for a rematch with SDSU.